Defense attorney Steve Fishman mocks Mertilla Jones’ testimony that Joseph Weekley pointed gun directly at Aiyana Jones’ head. 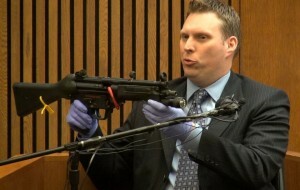 In fact, ME testified that direct contact gunshot wound was possible. 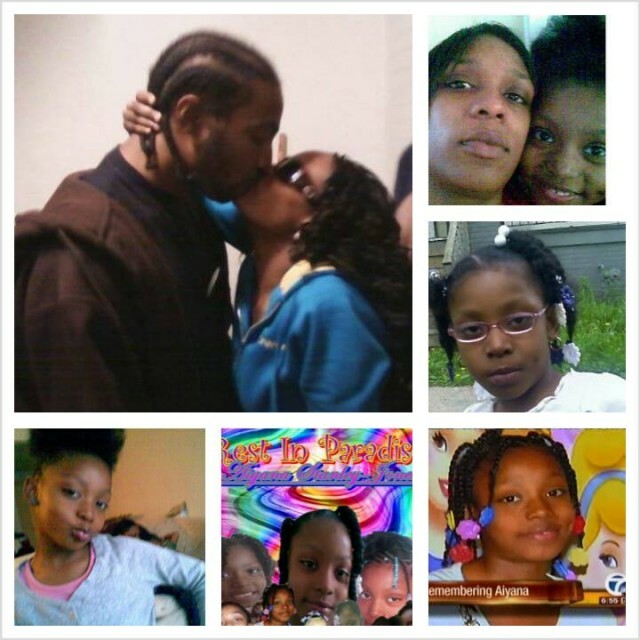 Fishman as well as much of local media has derided Aiyana’s family unmercifully since Weekley killed the little girl. DETROIT – In an atmosphere figuratively still smoking with tear gas from national rebellions against the Michael Brown and Eric Garner grand jury verdicts, Wayne County Prosecutor Kym Worthy has dismissed the only charge remaining against Detroit killer cop Joseph Weekley, Jr. Weekley shot seven-year-old Aiyana Stanley-Jones to death with an MP5 submachine gun on May 16, 2010 during a horrific SWAT-style raid on her home. 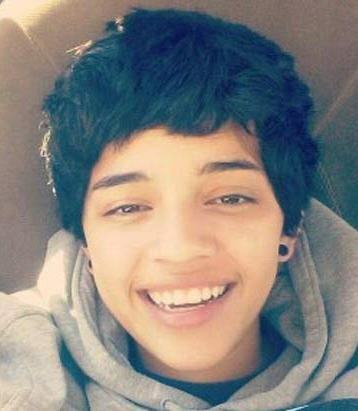 The announcement comes the same week as two 17-year-old girls, Jessica Hernandez and Kristiana Coignard, were literally slaughtered by Denver and Dallas police in circumstances condemned by witnesses and family and community members. 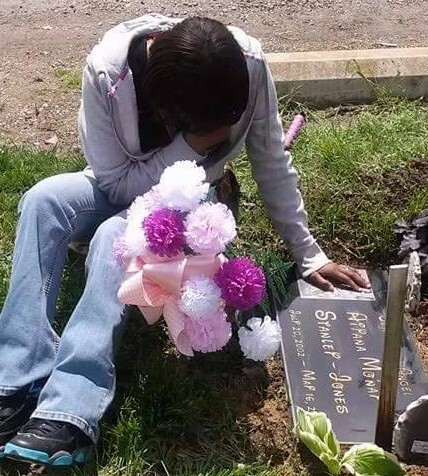 “Please continue to pray and hold our families up in prayer,” Aiyana’s grandmother Mertilla Jones said on Facebook. She was sleeping on a front-room couch with Aiyana when Weekley blew the child’s head apart. Wayne Co. 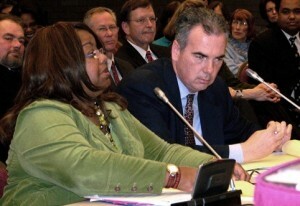 Prosecutor Kym Worthy testifies at state legislature; Asst. 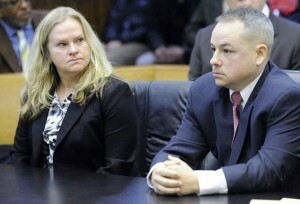 Prosecutor Robert Moran is at her side. He prosecuted both Weekley and Aiyana’s dad Charles Jones. There was no explanation of why Worthy dismissed the charge of careless discharge of a firearm. During both of Weekley’s trials, which each ended in hung juries, extensive evidence was presented that his gun could NOT be fired accidentally, and that officers are trained to keep their fingers off the trigger under any circumstances. A confidential source who knows Weekley told VOD recently that his gun safety latch was not engaged. VOD predicted this dismissal in earlier stories, based on confidential statements from an individual close to the prosecutor’s office. He wrote last February that the planned scenario was to dismiss the felony charge and get Weekley to plead to the misdemeanor, with Weekley serving no time. 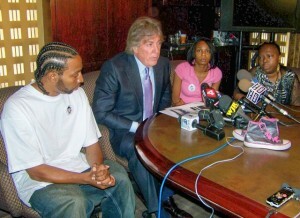 He added that many members of the prosecutor’s office were upset at the handling of the case. Assistant Prosecutor Maria Miller, communications director for Worthy’s office denied this was the case. 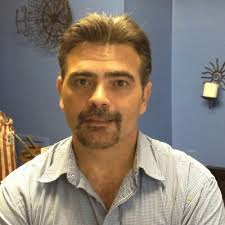 In fact, Worthy did appeal the dismissal of the felony charge, but an appeals court headed by notoriously right-wing, racist Judge Michael Talbot confirmed Wayne County Circuit Judge Cynthia Gray-Hathaway’s ruling. 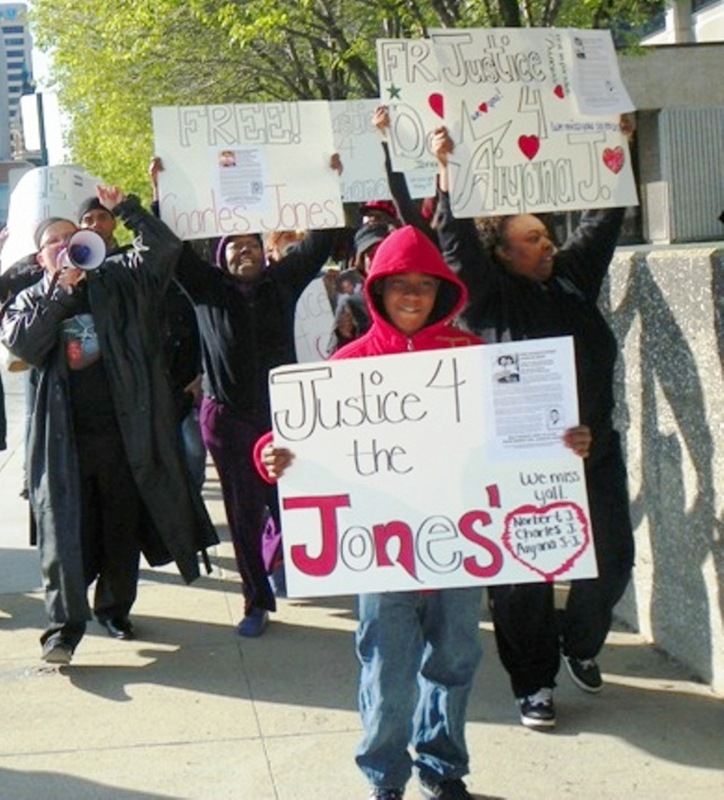 Rafael Hardy, 14, leads march for Justice for his cousin Aiyana and her father Charles Jones April 23, 2012 at Frank Murphy Hall in downtown Detroit, grandmother Mertilla Jones at left, aunt LaKrystal Sanders at right. Video above shows earlier view of raid on Jones’ home. Man lying prostate on street with cop’s foot in his back is Aiyana’s cousin, who cried out to raid team that there were children in the home before they entered and killed Aiyana. Her two toddler brothers, with their parents, were also present. Assistant Prosecutor Robert Moran prosecuted both Weekley and Aiyana’s father Charles Jones in what Jones’ attorney called a clear conflict of interest. Jones was in the home when his daughter was killed, with Dominika and their two toddlers. He was forced by police to crawl through broken glass, blood and bits of her brain during the raid, to sit for hours on the couch where she died, along with Dominika, both not being told their child was dead. From Dominika Jones Facebook photos: collage showing Dominika and Charles at upper left, with photos of Aiyana. A love that will never die. Jones is now serving a 40-60 year sentence on first-degree murder charges based almost exclusively on statements from jail-house snitches, which an appeals court allowed into evidence. Charges were not brought until 17 months after the killing of Jerean Blake, 17, the case in which he was charged. 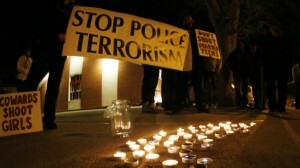 When Jones was arrested, police charged into his home with weapons drawn again, despite the presence of his young sons. 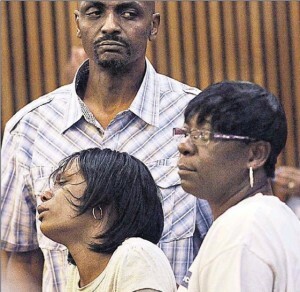 Dominika Jones, front, collapses after first mistrial in Weekley case. Her uncle Londell Fields (behind her) had to carry her out of the courtroom. Aiyana’s mother Dominika Jones has said before that she wants an end to the mockery of two previous trials against Weekley, due to the trauma she has suffered attending and testifying at them. She wrote on Facebook that she talked with Charles Jones after the announcement. “Just got off the phone with my love so not a good day for me but I am going to make the best of it and always hearing his voice make it better even tho the situation we both going thru gets the best of us,” she said. Dominika’s Facebook page is filled with photos of their family, the tale of a love that will never die. An attorney with the law offices of Geoffrey Fieger has filed an appeal of Charles Jones’ conviction. He is being held at the Oaks Correctional Facility in Manistee, Michigan, with a Security Level II classification, the second lowest. Some community advocates have said they will file an appeal with the U.S. Department of Justice. However, the USDOJ just told Fox 2 News that they will not file charges in the case of unarmed teenager Michael Brown, shot to death 8 times by Ferguson, MO cop Darren Wilson on Aug. 9, 2014, sparking uprisings in Ferguson and St. Louis as well as protests across the country. UPDATE: Hathaway congratulates prosecution, defense as she dismisses last Weekley charge, downplays Aiyana’s death as one of many. 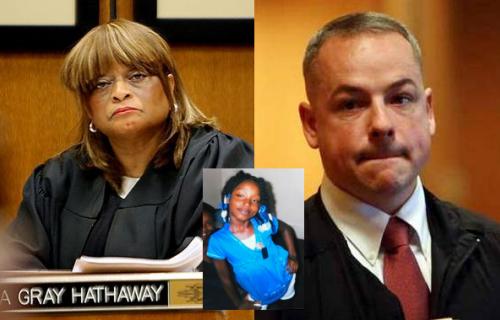 Judge Cynthia Gray Hathaway (l) has now dismissed all charges against killer cop Joseph Weekley (r) for shooting Aiyana Jones, 7, to death with an MP5 submachine gun. DETROIT – Wayne County Circuit Court Judge Cynthia Gray Hathaway dismissed the last charge, reckless discharge of a firearm, against Detroit killer cop Joseph Weekley in the 2010 death of Aiyana Stanley-Jones, 7, during a hearing Jan. 30. Hathaway earlier dismissed the most serious charge, involuntary manslaughter, at the request of the defense in Weekley’s second trial, although she denied the same motion during Weekley’s first trial. In rendering her ruling, Hathaway attached other names. “This was a tough case, not only because one child lost its (sic) life, but the genesis of this case was that another child lost its (sic) life, and one was intentionally murdered,” Hathaway, who is married to a Wayne County Deputy Sheriff, said. 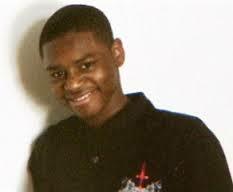 JeRean Blake, 17, killed May 14, 2010. VOD has published this photo numerous times. Judge Hathaway neglected to observe that while she was dismissing all charges against Weekley, Chauncey Owens and Charles Jones, Aiyana’s father, are serving lengthy prison terms, in the case of Owens, life without parole, related to charges in his death. Fieger, looking shocked, asked the reporter, “What has THAT got to do with it?” Fieger has said that his law firm will continue with the civil suit it filed in the case, which was stayed pending the conclusion of the Detroit bankruptcy case. Police had contended they were looking for Owens, who lived upstairs from the Jones family, when they conducted the raid. Police testimony showed, however, that they saw Owens several times during the day and could have arrested him on the street instead. But the raid team was being filmed by A&E’s “The First 48,” which considered Weekley and other team members TV stars. Jones and Owens were eventually charged with first-degree murder in the Blake case, and convicted in front of Wayne County Circuit Court Judge Richard Skutt. In Jones’ case, most testimony came from two jail-house snitches, after Skutt’s ruling to bar one snitch’s testimony was overturned on appeal. Co-defendants Allison Howard of The First 48 and Joseph Weekley. Judge Hathaway repeatedly delayed Weekley’s trials, stating in open court that she was waiting for Jones and Owens to be tried first, although there was no legal connection between the cases. Weekley’s co-defendant was Allison Howard, the “First 48” producer who provided their tape of the raid to a third person, during a party she attended with a police officer. Hathaway let her off on a charge of obstruction of justice with probation, served long-distance in her home state and on-line. 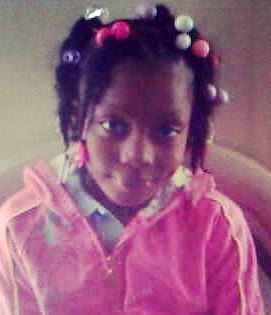 No charges were ever brought against her or A&E executives for being accessories to the killing of Aiyana Jones. Many have contended that the raid team, whose photos including that of Weekley are featured on the previous A&E “Detroit Swat” website, was clearly playing to the cameras. Meanwhile, Blake’s mother Lyvonne Cargill was featured on numerous talk shows and interviewed in the mainstream media repeatedly, casting aspersions not only on Jones and Owens, before they were even convicted, but on the entire Jones family. Hathaway allowed Fishman to present Facebook photos from a Jones family member’s website to the jury at Weekley’s first trial, showing some members allegedly holding guns and making what he described as gang signs. The photographers were not identified, nor were the time, date and place the photos were taken. 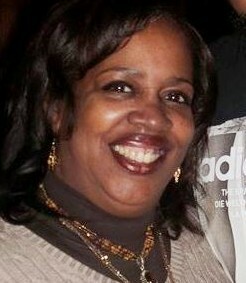 There were no guns found in the Jones family home, or upstairs where Owens resided, during the raid that killed Aiyana. 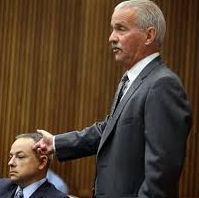 Moran objected at length to presentation of the photos, without the jury present. He only briefly noted his objection while the jury was in session, not describing its content. Then the photos were passed out to the jury. The jury in the second trial was not present when Hathaway dismissed the manslaughter case against Weekley, and no explanation was given to them. 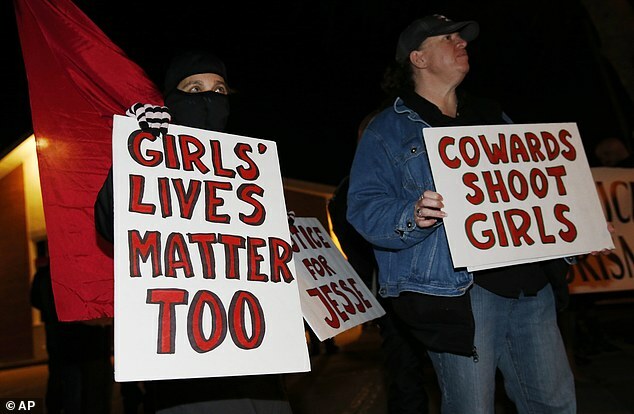 Protest immediately after Denver police killed Jessie Hernandez. The Denver Post reported that 200 more protesters swamped the prosecutor’s office yesterday. Denver — A passenger who was in a car when a 17-year-old girl was shot and killed by Denver police has disputed authorities’ account of her death, saying officers opened fire before one of them was struck by the vehicle. The passenger, speaking late Tuesday to The Associated Press on the condition of anonymity because of safety concerns, said her friend, Jessica Hernandez, lost control of the vehicle because she was unconscious after being shot. Police have said the Monday morning shooting in a residential alley came after Hernandez drove a stolen vehicle into one of them. Prosecutors on Tuesday promised a thorough probe of the shooting as a small group of angry protesters demanded swift answers and called for a special prosecutor to investigate the death. Laura Sonya Rosales Hernandez, Jessica’s mother, is asking for an independent autopsy in her daughter’s death. The shooting occurred amid a national debate about police use of force fueled by racially charged episodes in Ferguson, Missouri, and New York City. It was also the fourth time in seven months that a Denver police officer fired into a moving vehicle after perceiving it as a threat, and the city’s independent police monitor now says he will investigate the department’s policies and practices related to shooting at moving vehicles, which he said poses unique safety risks. Police spokesman Sonny Jackson offered no new details about the case on Tuesday, citing the department’s open investigation. 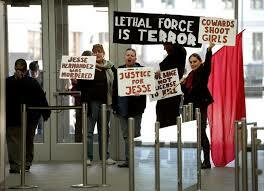 Protesters at prosecutor’s office demand answers in case of Jessica Hernandez. The shooting happened after an officer was called to check on a suspicious vehicle, Chief Robert White has said. A colleague arrived after the officer determined the car had been reported stolen. Police have said the two officers approached the car on foot when Hernandez drove into one of them, and they both then opened fire. The car’s passenger said police had surrounded the car in the alley, and Hernandez was trying to flee, attempting to drive around one of the squad cars. The officers came up to the car from behind and fired four times into the driver’s side window, narrowly missing others inside, the passenger said. Hernandez wrecked the car into a fence after she was shot, according to the witness. Police said the officer suffered a leg injury for which he was treated at a hospital and released. The passenger was unaware the vehicle was stolen and provided only vague details about what the group of teenagers was doing earlier in the night. By law, police are allowed to use force to stop and overcome the resistance of another person. They can use it to match the force and overcome it. Both officers involved in the shooting have been placed on routine administrative leave pending the investigation. VOD: They have now been identified by Denver police as Daniel Greene, a 16-year veteran, and Gabriel Jordan, a 9-year veteran, both assigned as Patrol Officers in District 2. Three cops, a 17-year-old and ‘a cry for help’: why did Kristiana Coignard die? 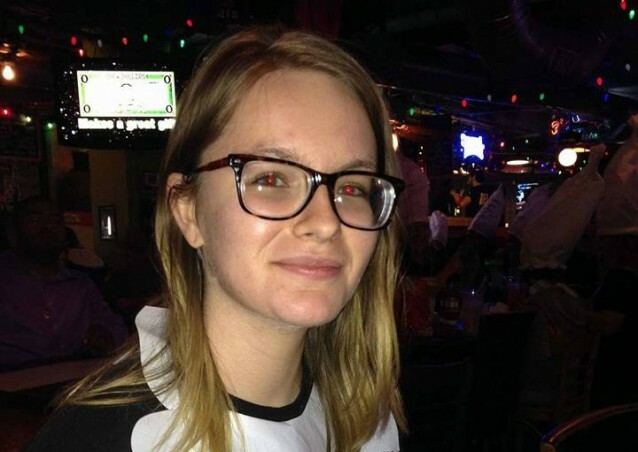 Houston, Texas –Just after sunset last Thursday, 17-year-old Kristiana Coignard entered a police station in Longview, Texas, a small city two hours east of Dallas with a history of police violence not all that different from the rest of the United States – but no less mysterious. Coignard picked up a red, wall-mounted phone in the police department lobby and asked to speak with an officer – for reasons that also remain unclear. The teenager may have been “wielding a knife”, according to the mayor. Police say “they were confronted by a white female who threatened them” – after which she brandished some sort of weapon, “made threatening movements toward the officers and was shot”. Motives on either side are still relatively unknown. 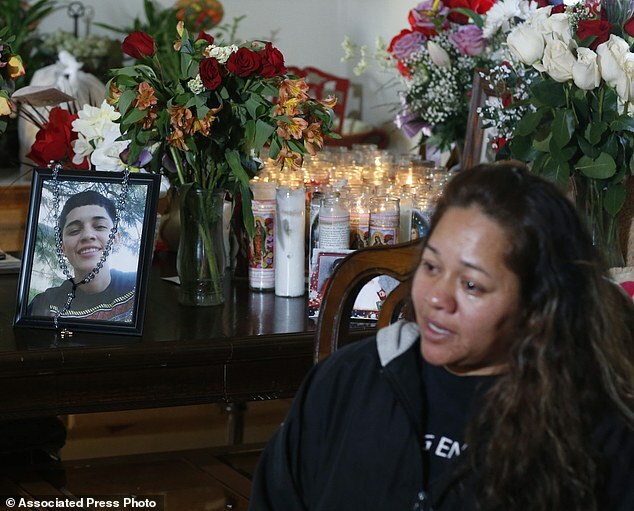 What is clear, nearly a week later in Texas and six months after police killings and community relations starting coming under renewed scrutiny across the US, is that another teenager has died after being shot “multiple times” by local cops. Three officers are on paid leave, the Longview police told the Guardian. A preliminary autopsy report has ruled the death a homicide. And in the case of Kristiana Coignard, as in what advocates and sheriffs agree constitute more than half of US police killings each year, the victim appears to have had mental health problems. Call it “justifiable homicide”: FBI statistics counted 461 encounters between police and those they killed with the threat of violence in 2013. Some have dubbed it “suicide-by-cop”, as about one-third of such cases can be classified – in addition to undoubtedly many more undercounted deaths. The hacktivist collective Anonymous prefers “trained to kill”. Whatever you call the overlapping patterns of police violence and brief encounters with young and possibly unstable citizens, mental health advocates insist the United States is “not keeping track”. On a Facebook page for the Longview police, a user claiming to be Coignard’s uncle wrote that “for quite a few years my niece suffered from mental illness”. The teenager was taking medication, seeing a therapist and living with her aunt, Heather Robertson, according to an interview with Robertson at ThinkProgress. She told the website that Coignard had struggled with depression and bipolar disorder since her mother’s death when she was four years old. Robertson said her niece had been “only violent with herself”. There is video of the killing, Coignard’s aunt said the police told her. A Longview police spokesperson, Kristie Brian, told the Guardian there are currently no plans to make footage available to the public. She declined to confirm the type of weapon Coignard allegedly brandished but said the department expects to release more details about the shooting later this week. The Texas Ranger Division is investigating the incident. Brian said Longview officers “are trained in all kinds of different situations”, including dealing with people with mental health problems, and that the county has a Crisis Intervention Team (CIT), which sees specially trained officers dispatched to urgent psychiatric situations. She said she did not know whether the three officers currently on leave had been CIT-trained. Coignard is the third person – and the third young person – shot dead by Longview police in less than a year. No charges were filed by a grand jury against three officers who killed a 15-year-old robbery suspect during a shootout last March. 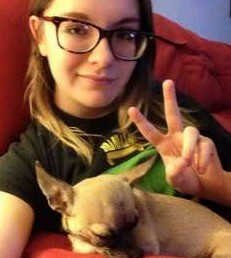 A 23-year-old cook with a history of making threats died in August after a routine traffic stop went awry. Three-and-a-half hours south, in Houston, the 2012 death of Brian Claunch had exemplified the potential for tragedy when police with limited training encounter a troubled individual in a pressurised situation. Though Houston has a widely praised CIT programme, two officers without that experience were called to a care home one night when Claunch, a schizophrenic, wheelchair-bound double amputee, started behaving erratically. Police said that he grew violent and cornered an officer while waving a shiny object in their direction. Matthew Marin shot the 45-year-old in the head. The object proved to be a ballpoint pen. 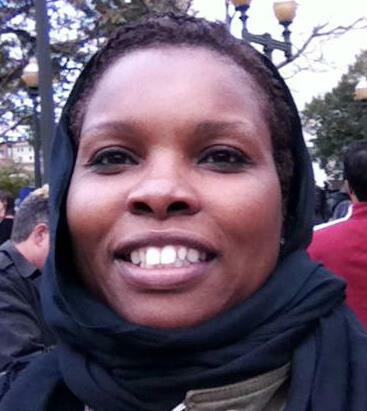 In June 2013, a grand jury declined to bring charges against the officer. That year a police officer in Dallas was dismissed from his job, and indicted by a grand jury in 2014, after he shot a mentally ill man who was holding a knife but standing still several yards away. The encounter lasted less than 30 seconds from the officers’ arrival to the gunfire. A third of “justifiable homicides”, the study found, could be characterised as “suicide-by-cop”, and many victims were not taking their medications nor under close supervision by mental health agencies. Not unlike the larger call for more reliable nationwide numbers to address all police killings, advocates say a lack of firm data leads to a standard of police responses to encounters with the mentally ill that depends on officer training and varies widely from department to department. “We’re not keeping track of that, so we don’t really have a handle on the situation,” said the Treatment Advocacy Center’s Fuller, adding that research indicated about half the US population lives in counties served by CIT policing. Ron Honberg, national director of policy and legal affairs at the National Alliance on Mental Illness, said his organisation has called on the US justice department to keep better track of deaths involving police and the mentally ill. Outgoing attorney general Eric Holder, whose replacement was expected to pass confirmation hearings on Wednesday in Washington, recently called the lack of more comprehensive police incident data “troubling”. 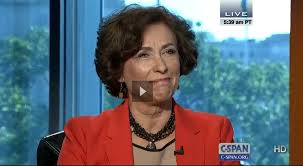 Honberg said the standard police response to someone behaving aggressively is often to “come in and be very assertive, and that can be exactly the wrong way to deal with someone who may be having a serious psychiatric episode” and may have a fear of the authorities. While better training and protocols are vital, he told the Guardian, at their core the violent encounters are “a manifestation of a broken mental health system”. Anonymous, in a video posted on Saturday, cited Coignard’s death as the impetus for a new operation called Stop Lethal Force on Children. In the US, the National Suicide Prevention Hotline is 1-800-273-8255 and the Trevor Project’s Lifeline is 1-866-488-7386.